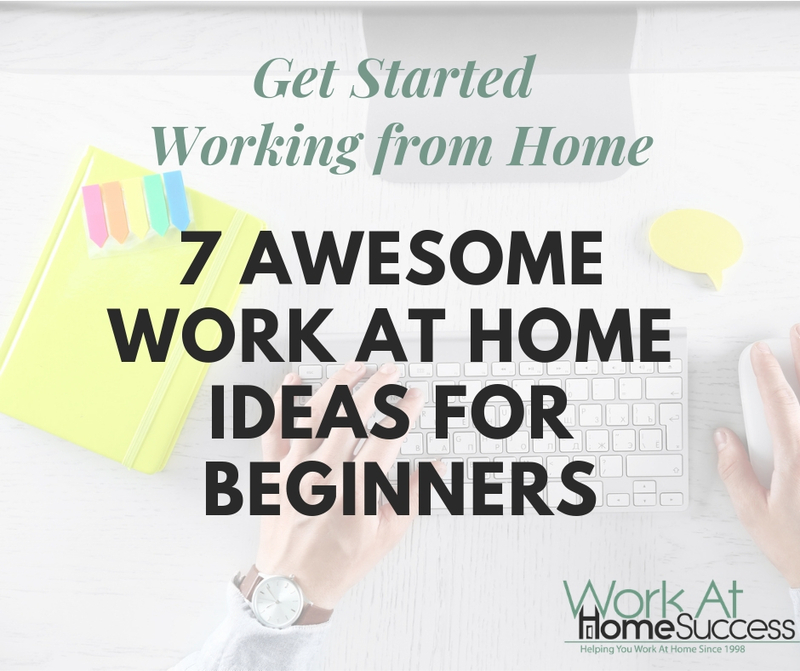 What do you need to get started working from home? Learn what working at home is and isn’t so you can save time and avoid getting scammed. Figure out the best option to make money based on why you want to work at home. Not all work-at-home options are ideal for everyone. Some jobs don’t offer flexibility. Some can’t be done while children are around. Make a plan and work the plan until you achieve your goals. If you can do these three things, there’s no reason why you can’t work at home!! 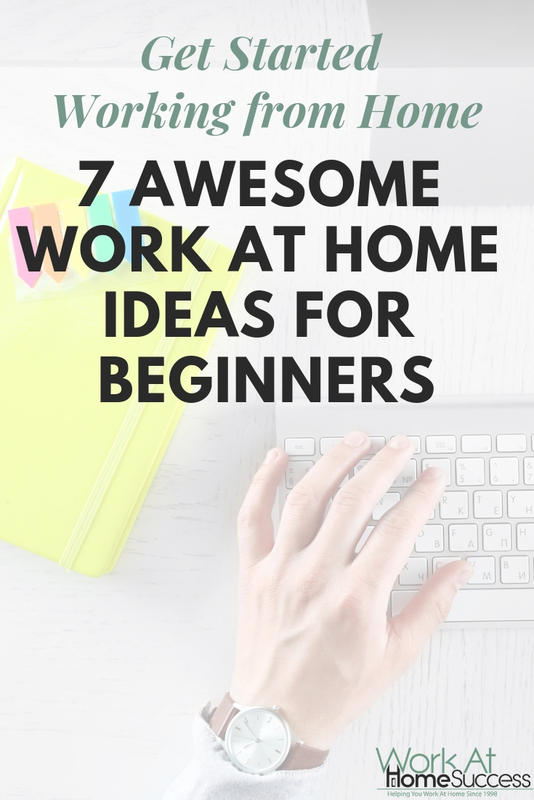 Below you’ll find information that helps you work through the above, plus 7 great work from home ideas that anyone can do. What you need to know about working at home. What is the best work-at-home option for you? How to make a plan and work the plan to achieve work-at-home success! What about money and resources? You can’t just sign up to work at home. Every work-at-home option I’ve ever come across requires a bit of preparation, planning, and often, vetting. Work at home options (jobs, home business, etc) are like any other type of work. People who work from home teach, provide administrative support, do bookkeeping, write, counsel, help customers and more. Work at home IS NOT…envelope stuffing or email processing, rebate processing, chain letters, helping people do business through your bank account, gifting, repackaging, etc. Most importantly, if you’re looking for employment, legitimate companies NEVER charge to hire you. They might ask you to pay for the background check, but that’s it. I get email and messages a lot in which people ask me to tell them where to get a work-at-home job. Their emails rarely mention their skills or what they’re interested in. These emails tell me that people still think they can just sign-up and get paid for something. But if you were to look for the job or start a business in the traditional work world, you wouldn’t start with a Google search of “job,” nor would you ask people to simply send you an idea. No, you’d start by figuring out what jobs you could do, or what business ideas interest you. The same is true when it comes to working from home. Everyone I know who works from home started by turning something they knew, love or did into income. Maybe they took a skill from a job and found work-at-home employment, started freelancing, or built a service-based business. Some turned an interest or a passion into a blog or other digital content business. But before we get to the best options for you, you have to also know what you’re hoping to achieve by working at home. Most people don’t want to work from home simply to work at home. Most have another goal that working at home will help them achieve, such as being an at-home parent, traveling, having a flexible schedule to help manage chronic illness, pay debt, or support a retirement. Because not all work-at-home options are conducive to all goals, you need to keep your goals in mind. For example, customer service jobs are not ideal for parents unless they can have uninterrupted time. If you want to travel, you need work that is flexible in time and location. So how do you find the best home based career for you? 1) Think about what you need from a job (flexibility? benefits? stable income? fun? etc). 2) Make a list of all your talents, experiences, and interests. Don’t just list things from your education and work. Also list things you know and do from your volunteer work or hobbies. 3) Find work-at-home options that meet most, if not all, your needs that fit with what you can do. For example, if you’re retired and want to travel, and you have experience with photography, you can turn that into a travel blog, or become a travel influencer on Instagram. Work-At-Home Success profiles – Read how other people, just like you, found an idea, and built their work-at-home career. I think most people are able to get through step one, and start step two, but they never put in a solid plan to achieve their work-at-home goal. They’re a little haphazard in knowing what to do much less in doing it consistently. If you want to work from home, sooner rather than later, you have to know exactly what you need to do, and then you need to do it. That means clearing time in your schedule to get things done. Make time. Finding time may seem hard, but if you want to work from home, you’ll need to find it and protect it. Get up an hour earlier, stay up an hour later, use your lunch time, stop watching YouTube or Netflix…whatever it takes, find at least an hour a day to start. Figure out what needs to be done to start your work-at-home dream. Do you need a resume? Do you need to buy a domain? If you’re not sure, you need to research and figure that all out. Make a plan that includes what tasks you’re going to complete by what date. Then do it! Add it to your planner and don’t let anything get in the way of getting it done. In the above section, we briefly discussed time, but what about money? You can make money without investing money, but depending on what you’re trying to do, the less money you have, the more time you’ll need to spend. That’s not necessarily a bad thing. It’s good to learn all the moving parts that it takes to succeed at home by doing them yourself. But if you have some money to spend, and can invest it well, you can speed up your success, simply by virtue of getting up and running faster, as well as having some automatic systems. For example, if you can pay someone to build your blog, you’ll save a ton of time figuring it out on your own. Even if you know how to do it, you’ll save time that you can spend on doing something that will make money, such as writing content. Tools and resources can help in getting a work-at-home job as well. While you can search and even get email alerts on free job search sites, a place like FlexJobs, does all that plus screens the jobs to make sure they’re legit, provides information about the company that you can use to beef up your resume, and more. Reliable computer. Even if you’re going to do phone work, a computer can be helpful, and some companies require it to submit hours. High speed Internet. Dial up or satellite is usually not accepted if you’re looking for a job. When you work for yourself, time is money, and you don’t want to lose it by having slow or spotty Internet access. Headset (maybe). If you plan to do customer service, reservation or other phone work, a headset can be handy and is often required. Most people I know who work from home, start out doing much of the work, but as they begin to make money, they invest some of it back into the business for things such as social media automation tools, bookkeeping systems, and virtual support. Still not sure what you can do from home. Below is a list of ideas that are accessible to anyone regardless of education or work experience. There are opportunities for people who don’t have a lot of experience. With that said, you may have to have certain skills. Many of the ideas below can be done as employee or contract worker, or you can freelance or start a home business, which can often earn you more money and give you some extra tax deductions. While many typing jobs require some experience, and most require a set typing speed, there are entry-level typing and transcription jobs. There was a time I discouraged people from pursuing data entry work because everything I found were scams. Times have changed and there are now legitimate data entry jobs. However, there are still a lot of scams, so you need to be careful. People seem to have the idea that data entry doesn’t require much skill or experience, but that’s not necessarily true. Some data entry jobs want data entry experience or knowledge of the industry. With that said, there are some opportunities for data entry for people who not have a lot of experience. You’ll find more opportunities if you can do more than data entry, such as research, typing, and other virtual support work. Writing requires that you have a basic understanding of language and grammar, but you don’t need a degree in English or journalism. The good news about writing is that it’s highly in demand and can be really fun because you’re constantly writing about new things. There are different types of writing, and some pay better than others. For example copy writing (marketing writing) and technical writing tend to pay more because you have to have a specialized knowledge. Some writing jobs are steady regular work, while others are one-offs. You can combine different types to make life interesting. For example, I have my two regular freelance gigs, but I often pitch ideas to online media for a one-off article (again, to get paid to promote WAHS). There are some that say blogging is overdone and it’s too hard to break in. While it’s true that it’s a crowded market, if you have a unique spin on a topic or a unique way of sharing it, blogging is still a viable way to make money. One of the benefits of blogging is that it’s flexible and portable, but can be expanded as you create more content and traffic. For example, many bloggers I know now offer their own digital products or have books based on stuff they posted on their blog. A topic people want to read about. Quality content that gives them what they expect and more when they read it. Monetization options such as affiliate marketing, information products, and more. Email list. The truth is most of the big earners in blogging do so through an email list. Amazon has created a ton of opportunities to make money from home including its affiliate program and self-publishing. But you can also sell your own stuff (new or used) through the Amazon store. If you’re like me, and hate having to package and ship tons of stuff to buyers, the FBA, Fulfillment by Amazon, program is for you. Simply list your items, put them ALL in a single box shipped to Amazon, and let Amazon do the rest, from taking the order and processing the payment, to shipping it to the customer. Also, don’t miss this free 7-Day Amazon FBA course by Jessica Larrew, who not only makes a great living through Amazon FBA, but helps others do so as well. If I was in the habit of telling people what they should do to make money at home, selling digital products would be high on the list of options I’d give them. Digital products can make a ton of money, offer passive income, and are affordable to set up to sell. You can sell ebooks on Amazon for free. You can sell an online course through Teachable for free. You can sell your photographs online through a variety of resources for free. Depending on what type of product you want to sell, it can take time to create. The longer the book or more extensive the course, the more time it takes to make it. However, once it’s made, you can sell it over and over. To be clear, I don’t think you can make a steady living with surveys, mystery shopping, phone apps etc. With that said, you can make money doing things you already do, such as surf the net, watch videos, play phone apps, and more. In essence, you can make money in your spare time. If you string together several of these options, you could make several hundred dollars a month. Plus, many of these resources can help you save money on stuff you regularly buy as well. Check out these posts on how you can make extra income from surveys, mystery shopping, phone apps and more. I really like the way you have introduced readers with the basics from requirements to planning for working from home. All the job options mentioned are on-demand with huge benefits and some of these can be made a full-time career option too, such as transcription. It facilitates with a decent amount of cash and flexible work hour. I’ll share this post with one of my friend who is looking to start a work from home job.